Home / Azkals / Football / Philippines / No Etheridge? Have Faith in Saca! No Etheridge? Have Faith in Saca! Here is how the situation currently stands as far as Neil Etheridge’s participation in the 2012 AFF Suzuki Cup is concerned. He is NOT going. Personally, I hope this is final to settle everyone down – the team, the fans and Etheridge himself. God knows it has been an annoying last 24 hours as far as the Etheridge situation is concerned. None of it the lad’s fault, but not good at all on the eve of the competition. Because the Suzuki Cup tournament does not fall on FIFA-sanctioned playing dates, there was always the possibility that Europe-based players would not be released. Thankfully, Dennis Cagara, Paul Mulders and Jerry Lucena are confirmed to play; ditto India-based Angel Guirado. The will-he-won’t-he situation concerning Etheridge began to unfold on the day when the Philippines were due to play Singapore last week in Cebu. An article appearing on the Bristol Rovers web site – the English League 2 club to which Etheridge had been loaned – stated that he had opted to stay in England to play league football rather than represent the country in the Suzuki Cup. Take the recent friendly against Singapore, for instance. At no time during the match was he really exposed; and when called to face a penalty, he saved. I, for one, will be very comfortable if he is our starting goalkeeper in Bangkok. My vote of confidence is not only on Sacapaño but, in fact, the entire team’s ability to defend. The veracity of this article was put into doubt by Etheridge himself, who in a tweet lamented that other people seemed to know more about the situation than he did. Subsequent reports said that he was trying to get the nod from Rovers so that he could play in the tournament. 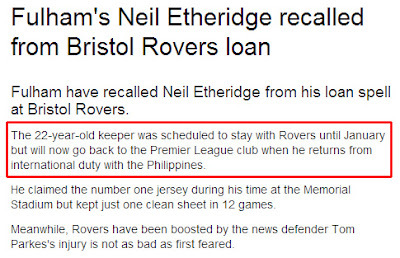 A tweet from the official Rovers Twitter account on 20 November seemed to indicate that Etheridge had been cleared to play in Bangkok. Those in the Philippines who are on Twitter probably saw that yesterday morning. Great news – or so it seemed! 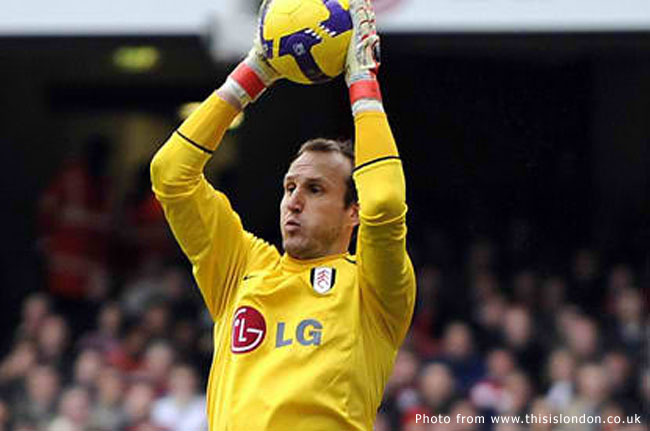 Last night, in a surprising twist to the saga, it was announced that Etheridge’s parent club – Fulham FC in the English Premiership – had recalled the goalkeeper back to London. The announcement was made on Fulham’s official web site and later confirmed by Rovers on Twitter. 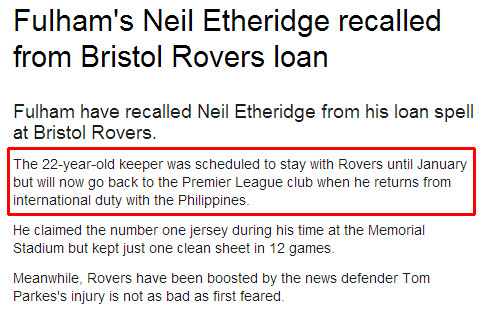 Unfortunately, no reason was given or if Etheridge would still be able to suit up for the Philippines in the Suzuki Cup. Hans Michael Weiss, speaking to Hardball on ANC via phone patch last night, said something vague about “the other ‘keeper being loaned” as a possible reason. 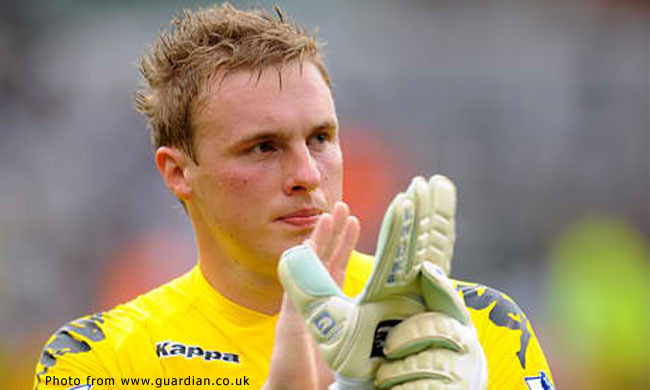 The obvious conclusion was that Fulham’s number 2 goalkeeper David Stockdale was going out on loan – as he had been previously – and Etheridge was being recalled as cover for the club’s first-choice goalkeeper Mark Schwarzer. This morning, an article on the Philippine Daily Inquirer confirmed the Stockdale loan and hopefully lays to rest the will-he-won’t-he Etheridge saga. Etheridge himself says that it has become impossible for him to go. Fair enough! This was something that we all knew could happen. The final 22-man squad will not be officially released by the Philippines camp until tomorrow’s managers’ meeting in Bangkok; but I personally hope that the goalkeeping issue is finally resolved. The same Inquirer report says that team management is doing its best to get Roland Müller released. All good if he does; and, indeed, Müller’s hands are as safe as Etheridge’s. Even if he is released, however, I am concerned about what a transcontinental flight and change of climates can do to him, particularly as the opening game is against the hosts, Thailand, this Saturday. For me, the sooner Eduard Sacapaño gets confirmed as the starting goalkeeper for the tournament, the better for all concerned. The more nervous players – and these tend to be the young and inexperienced ones – rather benefit from being told late in the day that they will be starting a match. By and large, though, most players are better served by knowing ahead of time that they will be playing. This enables them time to get ready inside the head, where it matters just as much as with the body. It cannot be confidence-boosting for Sacapaño to give a man-of-the-match performance in Cebu all the while knowing that he could be relegated to number two or even three once the Suzuki Cup got started. The only time that I really saw Sacapaño in action for the Philippines prior to the Peace Cup was in the Mongolia leg of the Challenge Cup preliminary round. While we lost that game, it was due to defensive errors. I thought Sacapaño was impeccable. Not quite the same imposing presence of Etheridge, perhaps; but somebody to be confident about in the absence of the former. 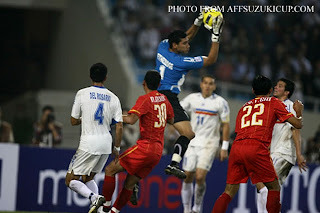 Granted, the opponents were lightweight in the recent Peace Cup; but Sacapaño was not adjudged Best Goalkeeper for nothing. He showed some signs of nerves late in the third match as Chinese-Taipei tried to rally. On the other hand, the entire team looked nervous in that stage of the match. Who would not be if you were trying to win your first tournament in a century? Many will be concerned about Sacapaño keeping goal because of his form when with his UFL club, the Philippine Army. Such fears are, in fact, baseless because he does not get as much protection from the Army as he does when he is with the national team. As for Etheridge, I hope he finally gets his big break in the Premiership. It benefits neither him nor Stockdale to be sitting on the bench waiting for Schwarzer to come to the point when he is really too old to be in the Premiership. When the latter eventually hangs up his gloves, I hope it is our boy who gets the nod. We all know what he is capable of.